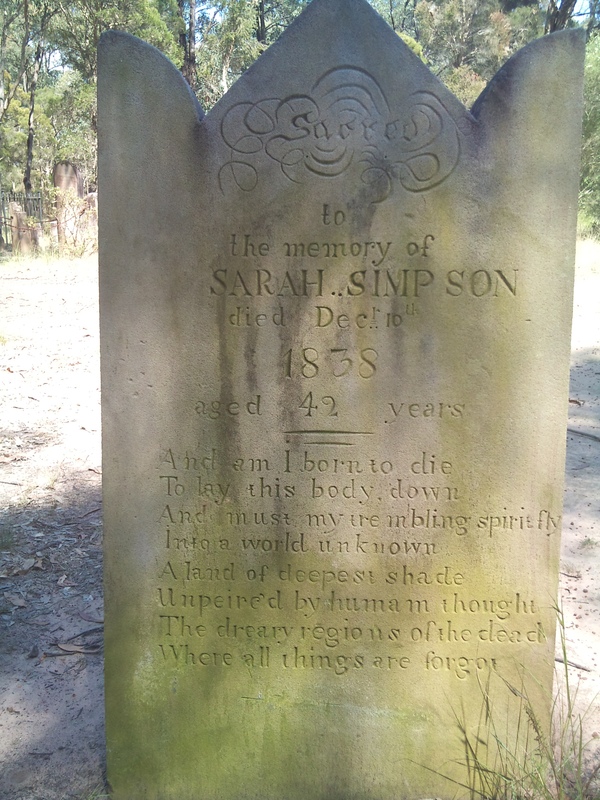 At last I’m posting a photograph of the grave of my great-great-great grandmother, Sarah Simpson, who arrived in New South Wales as a convict on the Friendship in 1818. As I’ve written about earlier on this blog, Sarah died in December 1838 and local legend says that she was murdered and that her ghost haunts Castlereagh Cemetery to this day. The reason this photo is so special is that it arrived in my inbox today, sent by my cousin Michael Wood, who is descended from Nicholas and Elizabeth Delaney’s son William (9th January 1817 – 14th December 1881). Michael has just got back from visiting the graveyard, where he took this picture. * That makes three of my ancestors lucky to escape the gallows, and who knows, I may discover more. What’s Tombstone Tuesday? you may ask. 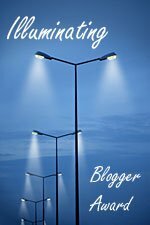 It’s an idea by the excellent people at Geneabloggers to prompt genealogy bloggers to write. If you’re one, do visit their website – it may inspire you, too. This entry was posted in Convicts, Nicholas Delaney and tagged Australia, Convict, convict ship, Friendship, genealogy, Sarah Marshall, Sarah Simpson, Sarah's grave. Bookmark the permalink. Hello, Sarah Marshall is my 4th great- grandmother, how is she related to you? Hi Annalise, Sarah is my 3x great-grandmother, through her daughter Lucy. Lucy married Thomas Delaney and I’m descended from their son Tom. Hi Craig, thank you so much! I may take you up on your kind offer. Were your Fields living near Castlereagh at about the same time as Sarah?? Very Sad to hear of the Vandalism, The headstone was quite covered in Graffiti as well as the historic noticeboard. Such a shame, and so disrespectful, I hope they did make arrests. Hi Kara, it’s good to hear from you. Disrespectful is exactly what it is. And totally pointless. Thanks for the links. The Telegraph article’s good – was that your quotation? I’m sure you’re right about the legend being the reason these idiots attack the cemetery. Pity the Telegraph got their facts wrong about Sarah being on the first Friendship! Glad to see the Sydney Spirit Stalkers on side. You’re the good guys! Hello Ann, I’ve heard that arrests have been made. I can’t understand why anyone would do a thing like vandalise graves. It’s senseless and has caused so much upset for descendants like you and me and other people who care about Sarah. It must have been very special for your family to visit Sarah’s grave and leave her a lovely tribute. Thanks for getting in touch. How wonderful to have a photo of three generations of your family at your (our!) ancestor’s grave. Thank you – I would love a photo! If there’s one good thing to come out of this it’s ‘meeting’ a new cousin, which is something that always excites me. I’m planning to write a blog post about the incident over the weekend. May I mention you? Hello again, I think I just lost my reply so sorry if you get it twice. Yes you may use my name in your blog. Apparently the vandals were identified by their “tag” graffiti by Police. I tried to send the photo but couldn’t and I’m not into facebook or other media, only email. I will persevere though. Hello Ann, and thanks. So the vandals tagged the headstones – they’re obviously not the brightest of buttons. Yes, I know Owen. He’s been a huge help. I met him and Mary once. Lovely people. Owen is so knowledgeable. I’ve got a copy of his book. Thank you so much! That’s wonderful.